D'Angelo has done a "Beyoncé", etc etc. 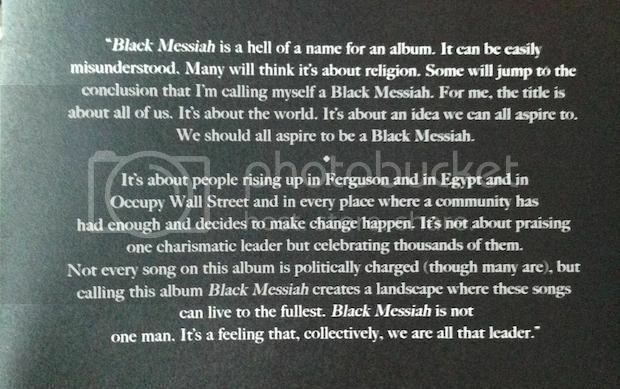 Fourteen years have passed since D'Angelo released the highly acclaimed Voodoo, but in a move which people are calling "a Beyoncé", the soul/R&B legend has dropped his new album, Black Messiah. The album was showcased in New York over the weekend courtesy of Red Bull Music Academy and Afropunk. However, for those unable to attend, the session was quickly followed by the unveiling of its first single, 'Sugah Daddy'. But what if you hate SoundCloud? WHAT IF? Well, how about listening to the entire album on Spotify? Time to change those End of Year lists, etc etc.